Fantasy Baseball Draft Prep: Draft Strategies, and Baseball is Back! Did you get up early to watch the season opener from Japan? Heath Cummings and Adam Aizer did, and get into that plus spring news and draft strategies. The Mariners and Athletics made the Tokyo Dome look rather small in Seattle's 9-7 victory Wednesday that opened the Major League 2019 season. Dee Gordon stole a base, Domingo Santana hit a grand slam and Matt Chapman looks healthy after a great spring and opening day. Heath Cummings and Adam Aizer give some thoughts on the opener and discuss key takeaways from yesterday's 12-team H2H Points mock draft (9:05). Gordon's steal was a big thing, at least for those in Roto leagues, but Chapman's big game included a double and three-run homer. 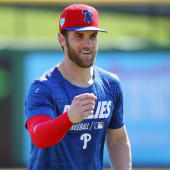 "We probably just need to accept he's over the injury," Cummings said of Chapman, whose prospects were dimmed a bit by shoulder surgery in December. "I think you start considering him (in drafts) around Round 10 .... I would take him over Josh Donaldson, and one guy going well ahead of him I'd definitely take him over is Miguel Andujar. "I would not take him over Justin Turner. I would not take him over Travis Shaw." News and notes (26:00) as we cover the Yu Darvish injury, the Mike Trout contract, the MIL bullpen and more.